In the Illuminatus! trilogy, Ludwig van Beethoven is depicted as an active member of the Illuminati. This was, perhaps, just a joke by Robert Anton Wilson, the big Beethoven fan. But apparently it may be true that Beethoven was influenced by Illuminati ideas. 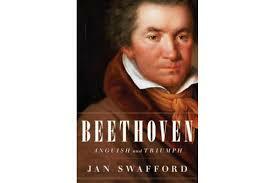 The latest big Beethoven biography is Beethoven: Anguish and Triumph by Jan Swafford. The hardcover comes to 1,104 pages, and apparently it took years for Swafford (a composer himself) to research and write it. It came out in 2014, but I have just finished it. (I am on vacation in California). Swafford says that Beethoven was exposed to Illuminati and Freemason ideas by one of his early teachers, Christian Neefe, and influenced by those ideas all of his life. There are "23 results" when you do an Amazon "search inside the book" for the search term "Illuminati." Neefe argues, convincingly I thought, that these Illuminati ideas influenced the composition of two of Beethoven's most famous symphonies, the Third (or "Eroica") and the Ninth. For example, Beethoven paid close attention to which keys he used, and the Third was composed in E-flat major, which Swafford says was the key Mozart used for Masonic music, such as The Magic Flute, which Swafford says was Beethoven's favorite Mozart opera. Schiller's "Ode to Joy" poem, used as the text for the last movement of the Ninth, was often sung in various musical settings, in Illuminati and Freemason meetings, Swafford says. Beethoven made several attempts to set it to music in his career, finally succeeding with his last symphony. 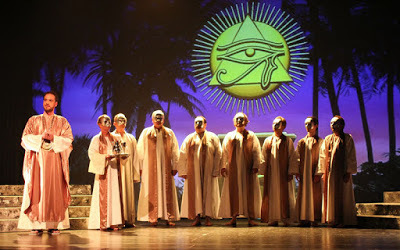 Scene from Mozart's "The Magic Flute." Source. I don't claim to be a Beethoven expert. Eric Wagner is more of one that I am. When I wrote to Eric (author of An Insider's Guide to Robert Anton Wilson), Eric commented, " I started the Swafford bio of Beethoven, but I haven’t finished it. I have reached the Third Symphony. I like it, but I find he lacks much sense of ambiguity. He gives a nice explanation of the role of the Illuminati, but I prefer Bob Wilson’s more tentative approach. Bob writes things like “perhaps the Illuminati does X”. Swafford says instead “the Illuminati does X”. Also, Swafford tends to overemphasize thematic unity between movements in Beethoven’s early works, I think. I find it interesting that Swafford does not include Donald Francis Tovey in his bibliography or in his index. I found one negative comment about Tovey in one of Swafford’s endnotes. I find this common among musicologists born after 1940: an overemphasis on thematic unity between movements in music before the Eroica and a negative attitude towards Tovey. Swafford includes lots of Kerman and Rosen in his bibliography, and his analysis of the Op. 18 string quartets relies heavily on Kerman’s analysis. Kerman sees Tovey’s writing about Beethoven as the finest writing about music period. I tend to lean toward Kerman’s views. Kerman edited a critical score of Mozart’s Piano Concerto K. 503, and the essays there really reveal this split." Much of the technical discussion in Swafford's book is over my head, although not Eric's. Swafford also does not make a final judgment on who the "Immortal Beloved" was, although he discusses the three main candidates. Thanks for the shout out. Bob Wilson liked Solomon's Beethoven biography which also discusses the Illuminati and its influence on the Big B.
I picked up a book in Boulder a couple of weeks ago about Beethoven by John Suchet titled "Beethoven The Man Revealed". I haven't got around to reading it yet as I am still getting through Science and Sanity. Are you familiar with this particular book about Beethoven Eric Wagner? Joshua, I have not heard of that book. My favorite book on Beethoven remains "The Beethoven Quartets" by Joseph Kerman.